Not long ago, I was asked to lead a wine-tasting fundraiser for the Madisonville Education and Assistance Center (MEAC). The event, a blind tasting called "The Sauvignons of Spring," gave the folks in attendance the opportunity to sample around 70 different cabernet sauvignons and sauvignon blancs. Each bottle had to be under $15. At the end of the evening, the slightly-tipsy assembled group voted on their favorites. Honestly, I can't remember the cabernet sauvignon which took top honors, but the announcement of the group's favorite sauvignon blanc raised eyebrows and brought a loud cheer from the crowd. The winner? No, not wine from Anderson Valley in Mendocino County, California, but Anderson Winery in Hamilton County, Ohio. This very small operation cranked out a white that trumped a collection from all over the world. So, what's the story of this little winery that could? "I started making wine about 8 years ago after my wife and I drove up the Northern California coast and came back down through Napa. We also spent some time in Calistoga. "When our first daughter, Ella, was born, we passed out our bottles of wine with labels reading 'Celebrating the Birth of Ella Marie Brokamp' with her picture and birth date along with weight, length, etc. Everyone was impressed with the wine and labels. 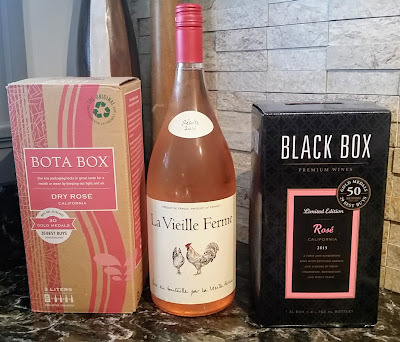 'My wife had the idea of selling custom labeled wine for special occasions and I looked into licensing requirements because you can't sell wine without a manufacturers license. After about a year and a half of research we figured out how to do it and have always enjoyed it." Since they make such small quantities of the wines, they don't market to stores and restaurants. Their sales are largely either Internet-based or done through word of mouth. Larry said that the most they've made in a year is about 40 cases. Larry said that he'd like to spend more time on his winemaking, but raising their three kids and running his law practice keeps him too busy to focus on expanding the business too much. How do the wines taste? Both wines are, by design, simple, straightforward quaffers. Larry said that his goal is to produce "something that most everyone can drink so it can be served at functions such as weddings where there are usually both [regular] wine drinkers and non-wine drinkers." The award-winning sauvignon blanc is definitely done in an American style -- acidic, but not overly so, with some very pleasant melon and green apple flavors and a mildly tart finish. It's quite popular, and as of the writing of this article, the white was currently sold out. However, there is more in the pipeline. The red is very "soft." It's quite light (only 12% alcohol) and fruity. The tannins are extremely light -- almost nonexistent, actually. It reminds me a bit of a Beaujolais, right down to the fact that it's best with a slight chill on it. The Sweet Partner in Crime and I had the bottle on a warm summer evening and it was a good, basic wine to just sip on, relax, and watch the neighborhood go by. Both wines sell for $12/bottle, which includes the labeling. I've tried a number of wines from "make your own label" places and have found most of them to be barely palatable. Larry and Kelly's wines are a fairly large level above most of those. If you're in the market for some interesting wine-based gifts or if you've got a party to plan, you won't need to look much further than Wooster Pike in Cincinnati. I was really struck by how well Nora Ephron's screenplay (interpreted wonderfully by Adams) actually hit the emotions of a foodie blogger. Little things that showed up -- Adams' reaction when she started getting comments from folks other than family; the giddiness the first time samples showed up on the door; the whole load of "is there anybody out there actually reading this stuff?" stuff. (I like to think the SPinC is a little less frustrated by this endeavor, as well.) Plus, there's just so much good food on screen (well, aside from the aspic). As Vine Reader Mike B. said when we were at Nectar's scrumptious Dinner Club (the theme was "peaches" -- yum! ): "When the movie was over, I just wanted to cook something!" I know I did. The movie's a fairy tale -- since she gets "discovered" and all that. I don't expect a phone call from Anthony Bourdain any time soon. But the thrill I get when the realization comes that a fair number of people actually read the stuff on here -- I think that gets conveyed well in the film. So, thanks to all of you who read the Vine and who keep me plugging away here. It's a great motivator knowing you're out there. I'd certainly recommend the movie itself, as well. As I said, it was a nice, easy way to spend an afternoon: lighthearted, well-scripted, and (except for a few rough parts in the "modern" segments) nicely acted. A solid, comfortable movie -- think of it as Hogue Cellars Cinema. Riesling is known to many folks who are just starting their wine education as "that sweet German wine that comes in the bottle that looks like a tower." That's true. Many cheap Rieslings are simply thick, tooth-searingly sweet concoctions. They don't have to be. It's true -- Germany is best known for Riesling, but it's a grape that's fairly common in cool climates all over the world. In the U.S., for instance, the best Rieslings tend to come from the Pacific Northwest and from New York -- our colder domestic wine growing climes. As with most cool weather wines, Riesling tends to be fruity and fragrant. They're also wonderful food wines. They're among the most pairing-friendly wines out there, standing proudly next to anything from sausage to Szechuan to sushi. They're some of the few wines out there that don't get absolutely clobbered by capsaicin, the chemical that makes hot peppers hot. Some Riesling, unlike many white wines, can even be aged, so don't get scared if you see older Rieslings in your local wine store. However, they don't necessarily have to be sweet. You've probably seen more and more "dry Rieslings" in stores as many winemakers realize that not everyone wants a bunch of residual sugar with their meal. Many of the "dry" Rieslings still have a hint of sweetness to them (try some Oregon dry Riesling if you want to see what I mean). While there's not as much variation in flavor as, say, Chardonnay -- each region that grows the stuff tends to put its own spin on it. The Alsace region of France, for instance, makes Rieslings that are fruity, but absolutely bone-dry. They've also got a more mineral character. German Rieslings range from very sweet to dry and generally have strong apple and pear tastes. American Rieslings, even of the dry variety, tend to be on the sweeter side and are usually very fruit-forward. Pierre Sparr 2007 Riesling -- This is one of those Alsace wines that I mentioned. It's a really nice example of a lighter styled, bone dry wine. The nose is of tart apples, with a flavor to match. The finish is crisp with lots of lime flavors. An absolutely delicious pairing with Asian cuisine. I had this with baked trout smothered in tomatoes, green onions, and shiitake mushrooms, flavored with ginger, garlic, and soy. Right around $15. Leasingham 2007 "Magnus" Riesling -- Australian Riesling has a completely different flavor profile. Much of the Riesling in Australia comes from Clare Valley, a relatively warm region for growing Riesling. Partly because of this climate, the fruit flavors tend to be fuller and the wines are often a little less complex. This particular wine has a spicy, apricot nose. It's full bodied, with intense flavors of peaches and apricots. Finish is fruity and dry with a smoky undertone. The recommended pairings from the winemaker are "seafood and spicy Thai dishes." I'd certainly agree. $10. Schloss Gobelsburg 2006 Riesling -- If you feel like treating yourself and going a little bit over the $15 (this is more like $20), you can get one of the more delicious Rieslings I've tried in my recent memory. This wine is from Austria -- known more for gruner veltliner, but slowly earning respect (and rightfully so) for other varietals. Simply put, this is a genuinely pretty wine. The nose is full of melon and apple blossoms, but that doesn't tell the real story. The SPinC described it as a "fruity, flowery cacophony." I concur. There's certainly a lot going on here, but the taste is probably best described as apple dominant. The flavor has just a touch of sugar and a little smoky note in the background. The finish is a little bit peppery -- like a junior gewürztraminer -- and slightly tart. Wonderfully balanced and just scrumptious to sip on. For dinner we had a calamari and rice noodle salad with a Thai-flavored dressing and loads of herbs from the garden. Worked nicely. Monica from Balzac, who previously let me try samples of both Espiritu de Chile and Golden Kaan wines, sent me something a little different this time around. I opened the box to discover a couple of cabernets from Lake County, California -- two 2005's from Snows Lake Vineyards named "One" and "Two." "One" was 100% cabernet sauvignon. "Two" was a 3-to-1 blend of cab sauv and cab franc. Both wines retail for around $45. I had to do a little background on Lake County to know what I was getting into. Lake County is immediately to the north of Napa. The soil is similar to Napa's, albeit on more mountainous terrain and with higher elevations. Lake County had a thriving wine business from the 1860's up until Prohibition. Wine production started up again in earnest in the 1960's. There are now about 9,000 acres of vineyards in Lake County (compared to Napa's 40,000+). Lake County, like Napa, is largely known for cabernets -- specifically powerful, tannic cabs. Tasting big cabernets, of course, is a perfect excuse (like I need one) to fire up the grill and toss a couple of ribeyes on there. No fancy rubs -- just salt, pepper, and olive oil. Sides were some grilled, herbed Yukon gold potatoes and some halved Cremini mushrooms, cooked down in a sauce of ginger, garlic, tomato paste, curry and cumin. I opened both of these wines a couple of hours before I thought we'd be having dinner. I wanted to give them enough time to breathe. My experiences with tannic wines have taught me that a couple of hours is a minimum for bottles like these. After the steaks came off the grill and were resting, we did a side by side of the two wines. Even after the time to breathe, the One was a tannic monster. The nose was huge with wood and violets, but the flavors of the wine were obscured initially by the overwhelming tannin. We broke out an aerator and eventually my super-duper Taste of Monterey tasting glass to speed up the process. That helped a little. The other flavors began to emerge. Layers of smoke, wood, and tobacco. (I guess this is what people refer to as "cigar box.") There are some currant and blackberry flavors in there, too. The finish hits you with a surprisingly tart burst that fades pretty quickly into a lingering coffee taste. "This doesn't finish as long as I thought it would...and I think that's a good thing." The Two was more pleasant. The cabernet franc blended in mellowed the experience considerably. The wine wasn't as tannic, but still certainly wasn't to be taken lightly. ("Doesn't beat you over the head" was my note.) The nose was much more berry and vanilla. The flavors were better balanced -- cherry, blackberry, and cocoa dominated. The bitterness of the tannins start out very strong on the finish, but they mellow quickly into smoke and chocolate with a mineral undertone that certainly wasn't unpleasant. With the meal, both wines changed. The One lost a little of its tannic edge and revealed more blueberry flavors. That tart burst on the finish remained, which I didn't find all that pleasant. The Two was much better. The tannins balanced the fruit nicely when paired with the steak. The mushrooms were really interesting, since they had a spice to them. The spice flavors gave way gently to fruit, then as the wine finished the spice picked back up pleasantly. That was probably my favorite gustation sensation of the meal. I had high hopes for these wines with chocolate, but I was disappointed in both. With both Dove dark chocolate and a brownie, each wine ended up a tart, tannic overload. Honestly, the leftover two day-old zinfandel that we had laying around before was a much better pairing. Now, don't get me wrong. I'm not saying that these are bad wines by any stretch. They simply aren't wines built for my palate. A couple of weeks ago, I linked an article from the Daily Beast by Keith Wallace entitled "The Great Cabernet Ripoff," which bemoaned the huge price increase in recent years for Cabernet Sauvignon. In my semi-uninformed opinion, my guess is that this huge increase is driven by folks who are more interested in collecting wine than actually drinking the stuff. Wine collectors' eyes big up when they see the words "aging potential." You've seen shelf talkers for wines that might state something like, "Drinks well now, but best between 2012-2017." The growers of premium Napa-style cabernets market to this. Both these Snows Lake wines are so powerfully tannic that, at least for me, they just aren't very pleasant to drink right now (although we both much preferred the "Two" to the "One") -- and I can imagine that they're built to be bought and stashed in a cellar for four or five years until the tannins settle down. I know that there are many folks out there who can taste these wines now and project how they will drink in 2015. Maybe these are good investments for some folks at $45 a bottle. As much as I really appreciated the opportunity to try these wines, they're difficult for me to pass appropriate judgment upon. Now, if some of you want to pick some of this up and invite me over in a few years to give them another go, be my guest! Before I leave Lake County, I wanted to find a Lake County wine that was more in my price range. I ended up with the Guenoc 2006 Lake County Cabernet Sauvignon for about $11. It certainly wasn't bad, and you could open this up right now without batting an eye. It started with cedar and blackberry on the nose. It's medium bodied, slightly alcoholic tasting, with straightforward blackberry flavors and some earthiness. The finish is a bit clipped -- starts strong with fruit, but quickly tapers off into a mild tannin. It's not nearly as complex as its more expensive cousins, but it's not built to be. It's a pleasant enough cabernet, especially with food (and it's much better with chocolate...).